Emergency services in Moray have stepped up their efforts to prevent a repeat of last year’s disastrous wildfires – described as some of the worst in 30 years. 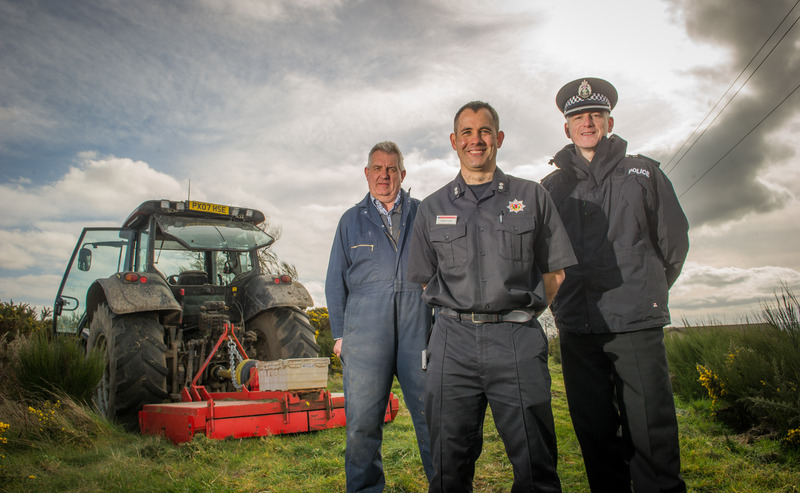 Firefighters, police and landowners have teamed up to create a fire break to protect homes and businesses in the Sunbank Quarry area of Lossiemouth. The spot, on land at the Pitgaveny Estate, has been a regular trouble spot over the years. It became so bad that a special taskforce was even set up, with firefighters, police officers, community wardens and staff from the estate working to clampdown on firebugs. L-R: Pitgaveny Farms manager Martin Birse, Inspector Norman Stevenson, Watch Manager Gareth Luce. And yesterday, a fire break was created between a set of homes and the gorse bushes that are often the starting point of the blazes. Efforts will now be made to get in touch with landowners of other common wildfire sites. Last year’s warm weather caused particular problems across Moray, with firefighters battling flames at Clashach Quarry in Hopeman for five days – putting resources in the region under serious pressure. Firefighter Ewen McIntosh said preventative action was crucial, and described last year’s spate as the worst he had seen in his 28 years of service. He said: “The fires were the worst I’ve ever seen as they stretched from Banff all the way down to Wick. “It was because it was such a warm summer that any spark combined with the wind would cause them. “The impact they have on the manpower is significant as if six fire engines are at one job, it has a knock-on effect elsewhere. Grampian has been on high alert this week after the fire service put a wildfire warning in place due to the dry and windy weather. A combination of leftover dead vegetation, combined with higher temperatures and low humidity makes it easier for fires to be sparked. But carelessness and deliberate fire-raising can also be to blame for the devastation. Gareth Luce, watch manager at Elgin and Lossiemouth, hopes to educate more people about fire safety to prevent incidents as summer approaches. He said: “These types of fire are a big problem in the region and can be caused by various things including by accident or wilfully. 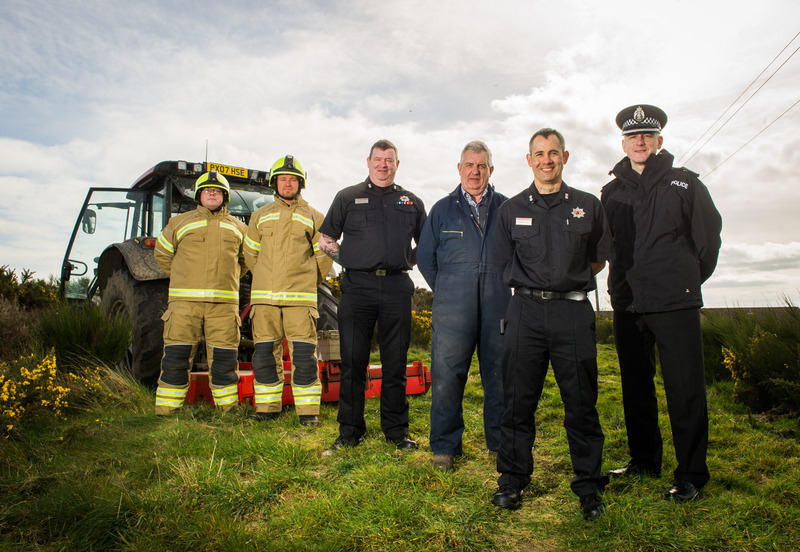 L-R: Firefighters Stuart Allen, Donald Peace, and Rural Watch Manager Ewen McIntosh, Pitgaveny Farms manager Martin Birse, Inspector Norman Stevenson, Watch Manager Gareth Luce. “We have been giving talks in schools to try and curb that sort of antisocial behaviour. “The fire break is getting done now as this time of year isn’t the busy season as it is not so hot, but another dry summer would cause problems. Detective Inspector Norman Stevenson backed the fire service’s efforts and said the force would play its part too. He said: “We are trying the minimise the risks of fire as it is a drain on resources for everyone and causes disruption to the public s well. “Keeping them to minimum is important as situations where something like a cigarette is cast aside can cause an extreme situation.